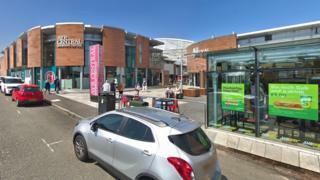 Music retailer HMV has announced that it has reopened its shop in Ayr Central shopping centre. The move follows what the company described as "successful negotiations" with its landlord. Two other Scottish outlets operated by the chain - Fopp on Glasgow's Byres Road and the HMV store at Braehead - have also been re-opened. Canadian firm Sunrise Records bought HMV out of administration but initially announced that 27 stores would close. The company said the news about Ayr was "the best outcome for our staff and customers". HMV managing director Neil Taylor said: "I am extremely proud of our staff who are the most knowledgeable and committed people you will meet, and so it is extremely gratifying to see this store open again, I greatly appreciate the support of all our customers and the landlord which made re-opening this store possible." HMV went into administration in 2012 before being bought by restructuring specialist Hilco, which took over the company and its 141 stores. That deal saw a total of 27 HMV and Fopp branches closing across the UK.